The Morning Showcase will be for companies seeking full-time employees and contractors for various positions, both technical and non-technical. What is the Startup Talent Showcase? 1) Attract And Retain Entrepreneurial Talent To The St. Louis Region. 2) Help Companies Hire Through A Unique Approach Using Our Pitch Format And PluggedIn Matchmaking Platform. 3) Connect Young Enterprising People To The City's Fast-Growing Startup Ecosystem. We connect talent to startups through a unique pitch-style event. Take a look at what it's all about. The Afternoon Showcase will be for companies seeking interns and current college students for Spring & Summer internships and temporary projects. I'm looking for a job. IS this event for me? Job candidates consist of students and new graduates representing regional universities and full-with technical and non-technical backgrounds as well as candidates with previous startup experience. Meet St. Louis' most promising, cutting-edge startup and growth companies representing a variety of industries. Get to know corporate firms and learn about internal incubators, innovation and M&A divisions, and rotational programs.Leave inspired, invigorated and empowered. A relaxed environment to grab some food, meet and mingle. Lunch will be served at Venture Cafe and Food Trucks (weather permitting). Companies hiring Spring/Summer interns check-in for the afternoon session. Companies can opt to participate in both morning & afternoon sessions. Students can come early for the noon networking and lunch. This is where the magic happens. Where meaningful connections are made, interviews happen, and even job offers extended. Stick around for snacks and refreshments! Please see the attached map to locate Visitor Parking. We recommend parking in the two parking lots along S. Sarah Street that accommodate visitor parking. Plan to arrive a few minutes early to locate a parking space, and give yourself time to walk the block west to @4240 Duncan Ave. You will enter @4240 from the west side of the building, which faces Boyle Ave. Hourly rates with a $12 max/day. Park in any space, not only the ones marked for visitors. The parking meters along Boyle Ave and Duncan Ave are available for visitors, with a 2-hour time limit. The 2-hour time limit is strictly enforced, and you cannot start a new parking session unless you move your car to a new parking zone. Do NOT plan on parking at a meter all day without getting a parking ticket. 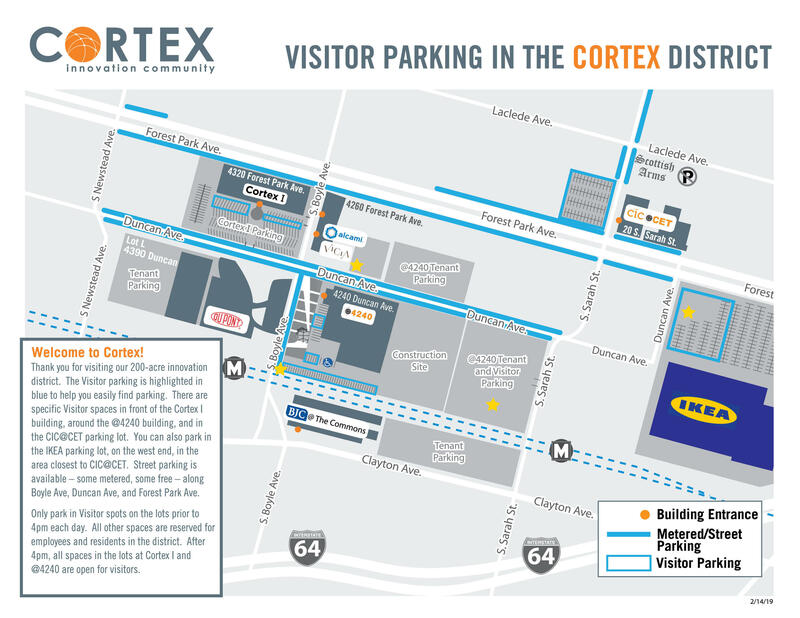 If you cannot find a place to park in either lot, please go to the IKEA lot, and park at the end closest to S. Sarah Street and the North Silo parking lot. IKEA kindly allows occasional parking in their lot, as long as we do not use the covered parking. How is this job fair different? This event is run in a pitch format. 1) Companies introduce themselves to job candidates. 2) Each job seeker will have one minute to pitch to companies. Companies will have a roster of job seeker participants to follow-up with candidates post-showcase. 3) The matchmaking process begins. This is where the magic happens. No booths. No resumes. No marketing materials. Is there a fee for job seekers? No, the showcase is free to job seekers & students. Is there a fee for companies? Yes. The fee for companies is $99. This cost covers both the morning and afternoon showcases, however, you can opt to attend one or both. Visit our site, create a company profile and start posting jobs! Is there a dress code for this event? No. Leave the ties and suits at home. Come as you are. We recommend casual, yet professional. I'm a job seeker. Should I bring my resume? No. Part of the application process is to create a job seeker profile on PluggedIN. You will be able to do this at registration. However, if you have business cards, we encourage you to bring them (with your solid personal pitch, of course). I'm a senior college student graduating in May. Can I attend the morning session for full-time job seekers? I'm a job seeker. How will I know which companies will be there? We will update the event site with company participants. You will also be provided a list of companies and their open roles 1-2 weeks prior to the event so that you can prepare. How will companies get candidate's resumes? We will provide the list of job seekers and contact info after the event. Companies can also access candidate bios & resumes through the PluggedIN recruitment and matchmaking platform. You can also request resumes from candidates post-event. I'm a company. Should I bring signage or marketing materials? No. You will not be given a table or booth space for your company so you won't need signage. What kind of job candidates will be at this event? All job candidates are pre-vetted by our talent team after the application process. Candidates are selected based on their entrepreneurial drive, their skill sets/experience and their interest in working at a startup or in an enterprising or technical role with an innovative company.